There’s a strong connection between remembering a word and having written it. I remember I once heard Ustaadh Nouman Ali Khan’s interview where he told that he used to write the Tafseer in Arabic and read Arabic material even though he didn’t understand the language. He kept doing it till he actually started understanding it (he was studying it too alongside). But the idea of him writing it down – no matter if he understood it or no, was really new to me. 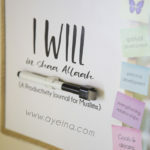 Then I recalled how my sister used to write the Qur’anic verses that she wanted to memorize – over and over. That’s how she used to learn them. 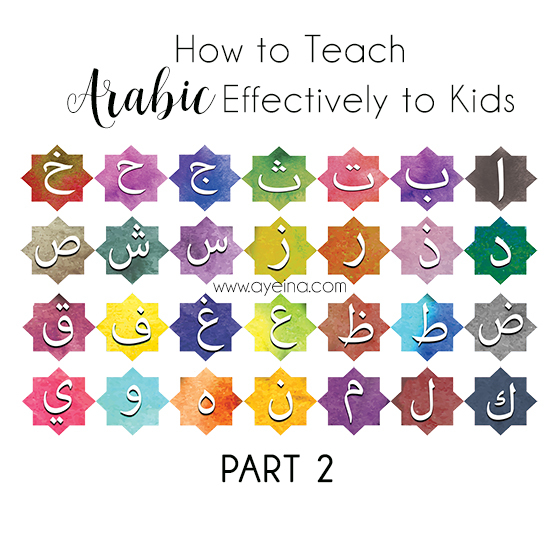 On her blog, TJ homeschooling has a compilation of textbooks to use to teach Arabic reading as well as a sample scope and sequence to teach yourself or someone to read Arabic. So let your kids write different words/sentences in Arabic and write with them. Make a game out of it perhaps. Make it fun! If you think they’re not ready yet, then it means that they need to read more to spell or write better. *Join some online groups to exchange ideas and information. Forums, Facebook groups, Twitter lists etc. Support is invaluable at times – It can give you a sense of community and common goals. It is important to be able to connect with people who are having the same difficulties or have successfully navigated through such difficulties. *Video chat with friends and relatives who have a child that speaks Arabic. Watch native speakers speak! Look at them whilst talking to see how they use their tongue and mouth and try to imitate. It’s easy using Skype or Google Hangouts or something similar. *Arrange playdates or playgroups with other parents who want to teach their children Arabic. Try to find other parents encouraging their children to learn Arabic, arrange to play together, go on picnics to the park etc. You can find them in your mosque nearby. You may find more common goals if you want your kids to learn good Islamic manners along with Arabic as well. Kids learn so much from other kids so their company matters A LOT. I remember, the first surah my niece memorized so seamlessly was the one she heard this other kid recite. We didn’t ask her to memorize it. She just did it herself. *Go to public libraries and check all the available resources in Arabic. Libraries are an excellent resource. If they don’t have things in Arabic, ask the librarian if it is possible to order them. Also, check out the noticeboard and see if there are any kids groups speaking Arabic in the area. You might make some new friends too. Whenever we are going somewhere, the whole way to our destination, I keep spelling out the billboards with my daughter. She keeps pointing at the board till I’m done. Living in an Arab country has that added benefit, BUT you can even translate the English word into Arabic and then spell it out for your child. Or if your child is able to speak, then he/she can spell it out for you. You can ask them to break down the word with any fun activity. For eg: I loved this creative submission “Hidden word Game” by Mama Q Tri. Instructions: Take a yellow paper, highlighter and LED Flashlight (blue light bulb) – If you don’t have a blue color LED light bulb, then color any light (small torch) with blue permanent marker and let your kids find a word amidst any shape that you draw (or they make). Recording them saying new words can help them improve their pronunciation. As Abeda (featured on Maktabatee) said: “Concentrating on a “word of the week” and “phrases of the week” helped with the kids’ Arabic vocabulary”. You can use Arabic audio books for stories or even simple Qur’an recitation (like that of Qari Hudhaifi). Arabic Audio books are a great idea to introduce Arabic seamlessly into your child’s life through fun stories. 3asafeer is an amazing example for that. Not only adults but also children automatically lose interest if they are constantly asked to do what they find difficult. When you ask them to learn only a few Arabic words at a time, they will find the task more enjoyable in shaa Allah. Praise them for all the hard work they put in and give them a hug or a kiss (or all three). 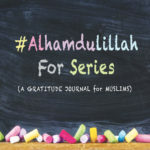 “Arabically” beautifully states: “Wonderful audio series called “The Children around the Prophet” by Dr. Hisham Al Awadi, sheds light on the Seerah of the Messenger (saws) from the point of view of the children around him – where he highlights the development of positive memories for children. Nurturing them not just through verbal gestures but also through comfort, hugs, and kisses. When I thread this idea into the philosophy of teaching our children Arabic, I am compelled to rethink what I teach and how I teach it. Maybe 10 years later, my children might not necessarily remember what spring or red is called (though remembering it is always better), but if they can recall the fun we had treading through those fall leaves, trying to call out different objects in Arabic and the positive energy, that serves the greater purpose. Here you have successfully created a positive association in their long-term memory bank. Gather enough of these, and years later your child, no matter where he/she is will have the confidence, the reasons, and the love to pursue the language of the Qur’an out of his own will. Keep this as a reminder for those days your child doesn’t remember vocabulary words from the past week or looks at you clueless when you give them an instruction in a “command form” (Fi’il Amr). Did you make it fun for your child? Were they left feeling confident about the concept? Do they look forward to your next mom and child Arabic learning time? Of all the Arabic resources in the world, Qur’an (mus’haf) contains Arabic in its purest form. Recite Qur’an WITH your children. You can put them in your lap and let them guide you as to which line they’d like you to read. It also gives them control and along with that, makes them familiar with the sound of this beautiful language alhamdulillah. 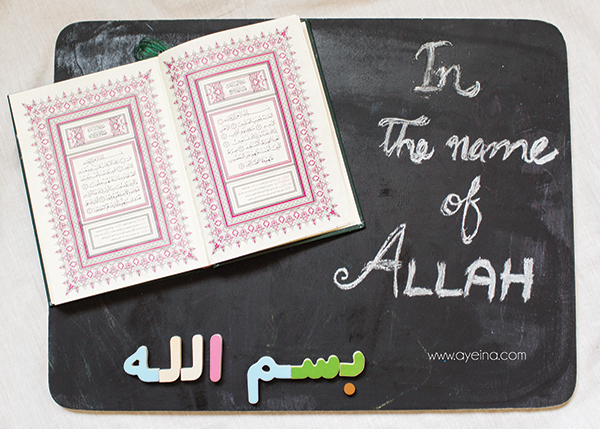 When you put Qur’an first in your life, your child would automatically want to do the same as well in shaa Allah. Have a personalized notebook especially used for learning Arabic which your child can constantly refer to for revision. Let them choose the notebook and decorate it any way they want – to make it special. You can even use it to have your child draw whatever you say in Arabic. Go back over the pictures every few days. It will help them link new words to images. Doing this will help train their brain to think in Arabic instead of searching for translations in their head. Other than that, Do all of the above on repeat! In short, Love the language to Live the language! Oh masha’Allah am loving that hidden word game! May have to try that with Bee. Totaly support the 5th,6th and 11th point. I think association with the Quran is the best motivator to learn arabic. Good job. True. Because knowing where to apply the knowledge can make a huge difference. I definitely remember things after writing it down! 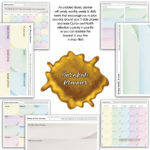 I’m a planner addict you see and it really works for me. I think I could actually use your tips myself to brush up on my Arabic! I LOVE the hidden words game! Jazakillah for the reminder about the way we teach our children. It’s so easy to lose patience, but I have to keep reminding myself that if I want my kids to love something then I have to introduce it with love!